It sounds ponderous to say that Geoffrey Chaucer (1342-1400) wrote one of the most important works of English literature, but it is true even though the 'Canterbury Tales' is so much fun to read. The first to exploit fully the literary form of the tale, it is a series of verse stories told in turn by each of a motley group of pilgrims en route from Southwark in London to Canterbury to visit the shrine of Thomas a Beckett ('the martyr'). Ranging in tone from vulgar humour to serious moralising, the stories are unified by common themes, notably a contrast of the 'loose woman' and the virtuously long-suffering one. Chaucer began writing the tales late in his career (1387), but died in 1400, leaving them unfinished. 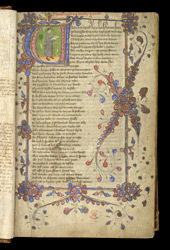 Made within a few decades of Chaucer's death, this manuscript is the earliest known copy of the 'Canterbury Tales'. The early manuscripts of Chaucer's writings have the first portraits which are thought actually to resemble an author. Here he is shown in the mould of the serious literary figure, despite his footgear. Some scholars believe that Hermann Scheerre, an innovative artist who probably trained in Flanders, painted the portrait, which means that the manuscript would probably have been made in a London workshop. This page has the beginning of the prologue, which opens with an image of April weather.